In the south, we tend to think of allergy season as the early spring when we see the heavy yellow pollen on our cars, well basically on everything. The crazy thing about this pollen is that very few people are allergic to this yellow pine pollen. It is the tree pollens we can’t easily see that give us the most outdoor allergy problems. Of course there are indoor allergens that can be just as bad for some people. The indoor allergens are a problem year round, with most common ones being dust mites, pet dander, mold and mildew. What can you do to help with indoor allergens? Well, for dust mites which typically are found in carpets, bedding and upholstered furniture you need to use High Efficiency Particulate Air (HEPA) filters. These help eliminate dust and other allergens, including pollen in your home. You should also dust with a damp cloth weekly, wash all bedding weekly and vacuum carpets often. Pet dander is another common indoor allergen that bothers a lot of people. What can you do if you love cats and dogs but are allergic? Try to keep them off upholstered furniture and carpets and out of the bedroom because their dander, or dead skin flakes will remain in the carpet and furniture. Bathe pets frequently to wash away dander as well as any pollen that may be in their fur. You should also have your carpets steam cleaned often. An allergen that is both an indoor and an outdoor problem is mold. Indoor molds grow in damp areas, like under a sink, basement or in the shower or tub. Outdoors mold is found in the fall in piles of leaves and weeds that have gotten wet and are rotting. You can keep mold levels lower by keeping bathrooms, basements and other damp areas clean and as dry as possible. You can help eliminate outdoor mold by removing leaves and weeds from your yard as soon as they fall. Probably the most common allergen we think of in Georgia is tree pollen. Tree pollen is usually the first seasonal allergen to appear in our area each year, often as early as January. By February we start to have other pollens in the air, such as alder and maple. March is when most of us really begin to feel allergy symptoms from pollen, pollens from juniper, elm, oak and alder really start to appear. Weeds also begin to pollinate and bother people’s allergies as well. April is still very pollen filled, with weeds such as nettle creeping in our area. May hits many people quite hard, getting hit by both tree and grass pollens. June is the height of grass pollen like Bermuda, rye and oat. July is when weeds really start to come in strong. By August and September, weeds such as pigweed, ragweed, and nettle are in full effect. Mold also really begins to affect some people at this time as well. Mold is the main concern for November, as ragweed has finally started to end. In December, outdoor allergens are at their lowest of the year. To avoid pollens, you should try to not go outdoors between 10 AM and 4 PM if at all possible. If you do go out, shower immediately, including shampooing your hair during peak pollen season. Also wash your pets as soon as they come in from outdoors. They are little pollen magnets and bring it into your house on their fun. This can be difficult though when the question “When is allergy season?” is not even really relevant. The best and most effective way to deal with allergies is the find out what you are allergic to. You can do this by have a simple, fast, allergy test done at the ENT Institute. 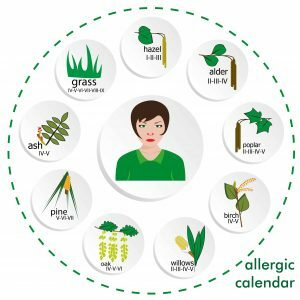 Once you know exactly what you are allergic to, you can begin to take the right steps to eliminate these things from your surroundings and also begin immunotherapy to help your body better handle these allergens and build up a tolerance for them.